Successfully Added Perfectly Simple USB DVR to your Shopping Cart. Introducing the Perfectly Simple USB DVR. When you hear DVR you don't always think simple, but with the Perfectly Simple USB DVR anyone, and we mean everyone, can turn their own computer into a brilliant USB DVR. Capture live video directly to your computers hard drive with this amazing USB video capture device. Turn your computer into a DVR for recording AV input from multiple video devices with this one simple product! 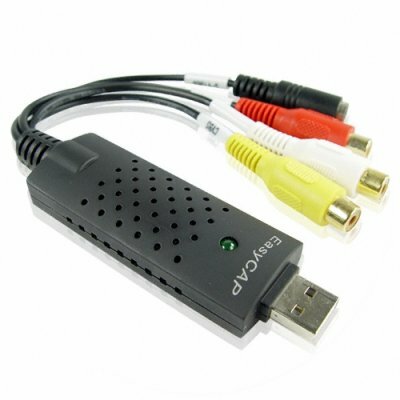 This easy to use USB video capture device takes streaming video from sources such as TVs, DVD players, camcorders, VHS players, and video game systems, and captures them digitally to your computers hard drive for easy file transferring and quick video playback. This is the perfect way to record your favorite TV programs, create videos for YouTube, or simply a great way to get rid of those old VHS and camcorder tapes that are collecting dust in your living room. Why would you want to digitize old VHS and camcorder tapes? Let’s face it, analog tapes take up space, are inconvenient to watch, and have a limited shelf life. Why not protect your beautiful memories and make watching videos fun and convenient by going digital? The included video editing software makes it easy to select only the scenes that you want to save, and converts them to user friendly computer files. Capture live video and play it back whenever you like, share it with your friends and family, or upload it to Youtube and and share it with the world. With the CVSA-409 you can do it all from the comfort of your home and for less than $15! Order the CVSA-409 now while this product is in stock and ready for immediate shipping. Available only from the leaders in wholesale electronics, Chinavasion. on 2009-08-06 04:14:20 Works and super fast shipping too!